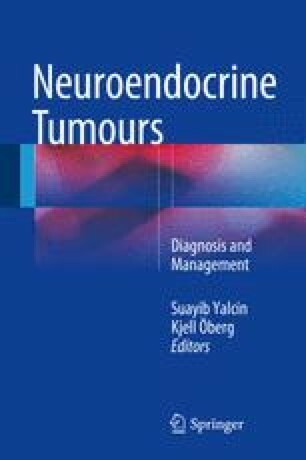 Gastroentero-pancreatic neuroendocrine tumours (GEP)-NETs have had rising incidence during recent decades, due to improved detection by multidimensional imaging and endoscopy and increased awareness of histological features. A majority of NETs have malignant properties, but often have slow and indolent progression, except a minority group with poor differentiation and aggressive behaviour. Foregut or gastric NETs have variable disease presentation and different, type specific requirements of treatment. The most common gastric NETs occur secondary to chronic atrophic gastritis (CAG), with considerably more benign features than non-CAG-related gastric NETs. Metastatic midgut or small intestinal NETs (Si-NETs) have been over-represented at referral centres, as the common cause of the carcinoid syndrome, which has required combined oncologic and surgical treatment. The Si-NETs have early spread to locoregional lymph nodes, the root of the mesentery and the liver, but may with appropriate surgery and somatostatin analogue treatment expect long survival. Hindgut or colorectal NETs are not associated with the carcinoid syndrome; the vast majority present as incidentally discovered small polyps, which can be safely removed by endoscopy, whereas larger and deeper invasive lesions often require extensive surgery combined with other treatment. Surgery is the only potentially curative therapy for localised NETs, but may often be crucially important also with advanced disease. Appropriate surgery can be a necessary prerequisite and improve results of other treatments. A multidisciplinary approach, with involvement of oncologists, surgeons, radiologists and pathologists, has proved important for recent progress in the management of NETs.